Jelly Belly® Gift Box - 17 oz. Oh, the flavors of Jelly Belly® jelly beans! Green apple! Cinnamon! Eat them together and it's apple pie! The fun will last a long time, with 40 flavors in this 17-oz. Jelly Belly® gift box. Includes flavor ID chart and a "recipe" guide for combining jelly bean flavors. 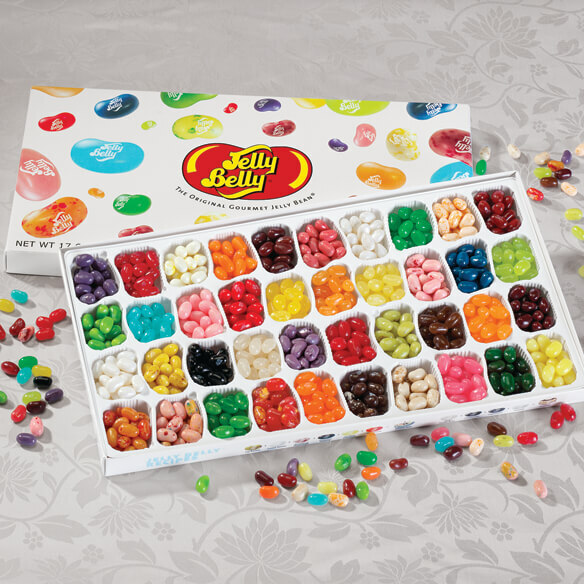 Jelly Belly® candy is fun for guests, kids-young and old! Jelly Belly Gift Box the BEST ! When I discovered Miles Kimball's Jelly Belly Gift Box several years ago, I ordered one as a surprise Christmas gift for my husband who loves Jelly Beans ! Now every Christmas he looks forward to his Jelly Belly Gift Box. He thinks they are the very BEST !! He is never disappointed, because it is always under the Christmas Tree. I got this for my mom for her birthday. She loved it! Original Jelly Belly are the best! I purchased this product as a gift for my daughter. She loves giving different flavors to her friends to try. There is nothing "not" to like about this product. Unless you "don't like" a particular flovor--and the beauty is you don't have to eat that flovor. They are awesome to say the least! Gave this as a gift. I selected it based on the variety of flavors offered in the package. Satisfied. This was enjoyed by my grandsons. Like I wrote above, they were enjoyed by children, but their parents enjoyed them also. My husband is very fond of them. Liked the recipt book that was included. ALWAYS BEEN A JELLY BEAN LOVER AND THIS TAKES THE CAKE. The jelly bellies were fresh but the box was clumsy. My family liked to taste all the different flavors.